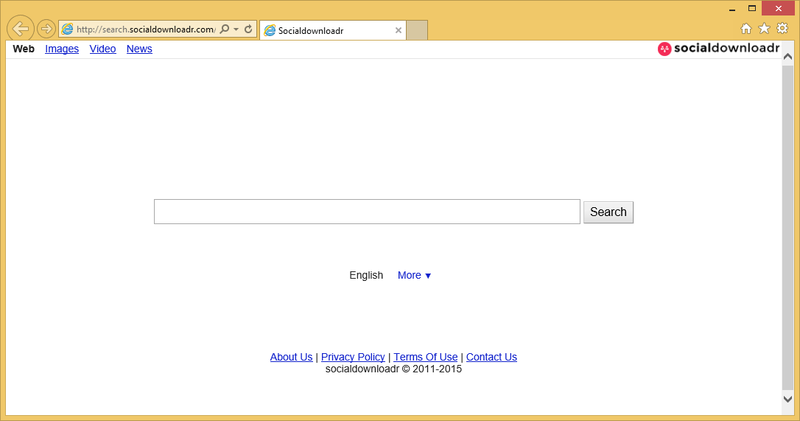 Search.socialdownloadr.com is one of the most generic browser hijackers you will ever see. Designed to take over your browser options, this PUP (potentially unwanted program) will make your browsing experience insufferable. Moreover, the application will expose you to a number of Internet threats. If you do not delete Search.socialdownloadr.com as soon as you notice the program, you might get heavily infected with computer viruses. First of all, you should know what modifications have been made to your default browser. The hijacker changes the most important options, that is, it replaces the default home page and search provider. Even the new tab window is modified so that you could not escape SearchSocialDownloadr that easily. So, what you need to do is to remove Search.socialdownloadr.com from your PC system entirely. Do not worry: you will not miss the invader because it cannot offer any browsing advantages. The application is extremely annoying because it can attack all the popular browsers. This means that even if you have Google Chrome, Mozilla Firefox, and Internet Explorer all at once, you still cannot browse while the infection is here. Do your PC a favor and uninstall Search.socialdownloadr.com before anything serious happens. Also, our team warns you not to surf the Internet with the new search provider. You see, sponsored links are displayed, and they can be quite a threat. You can see them at the very top of your results under a tag “ads”. In addition, going to your favorite pages might not be safe anymore. The hijacker injects the webpages with commercial advertisements that can be dangerous. Do you know what dangers may come from third-party ads? First of all, you may get redirected to a page that is run by hackers. In this case, your PC might get various viruses. What is more, pop-up windows can become a part of your daily life. If you notice suspicious gaming or dating sites popping up, terminate Search.socialdownloadr.com completely. Lastly, your personal information is at risk if you use the browser hijacker. It might be collected and shared with cyber criminals. How did my computer get infected with Search.socialdownloadr.com? It is an easy question to answer. A lot of infections arise from negligence. This case is no different: when users download free software without paying much attention to the process, they get attacked by potentially unwanted applications, including Search.socialdownloadr.com. If you do not want to get PUPs from software bundles, always pick the Advanced/Custom mode of installation. How to remove Search.socialdownloadr.com from my personal computer? Ir order to erase Search.socialdownloadr.com successfully, you need some help from a reliable anti-malware and anti-spyware program Wipersoft . If you do not hesitate and download such a tool and scan your computer immediately, your problems sho0uld be over soon enough. Removing malware automatically is the recommended way by our security team. I am actually grateful to the holder of this web page who has shared this information about this threat.